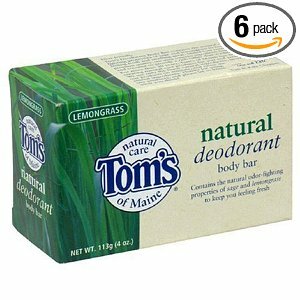 Tom's of Maine Natural Care deodorant Body Bar contains sage and lemongrass which are known to have natural odor fighting properties. This helps you keep that clean fresh feeling without having to spray artificial ingredients on your skin. It should also have a rich pleasant smelling lather made from palm and coconut extract, says Tom's of Maine. The soap doesn't contain any artificial fragrances, colors or preservatives and no synthetic detergents or animal fats, which I'm sure a lot of you ladies will be glad to hear. This Natural deodorizing soap comes in a pack of six 4oz bars, so should last a while. I have summarized the lists below from the reviews of the people using the soap. If you are interested about the ingredients used in Tom's soap and want to know where they come from the website is very insightful. Tom's of Maine has seemed to have made many fans when it comes to the deodorizing soap. The users didn't have anything negative to say about it. They adore the soap as all the ingredients are natural, it smooths dry skin and it leaves them feeling clean and fresh all day long. It is quite reasonably priced at $18.78 for a 6 pack, so could be worth a try if you like to use natural products on your skin or are sensitive to artificial ingredients.